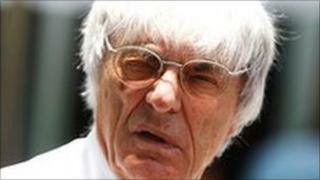 Bernie Ecclestone has said reports that Rupert Murdoch's News Corporation is in talks to buy Formula 1 are "rubbish". Sky News said the media mogul's company could make a joint bid with Mexican billionaire Carlos Slim, who sponsors the Sauber team. However, such a move could face regulatory hurdles and breach F1's own Concorde Agreement with the teams. Mr Ecclestone told BBC Sport that he hadn't been approached by anyone named in the report about a deal. "I know Rupert and [News Corp international boss] James Murdoch and Carlos Slim, and if they wanted to do anything they would contact me direct. And they haven't," he told the BBC. F1 is owned by the private equity firm CVC Partners, which paid about $1.7bn for the business in 2005. Any takeover would involve changes to the Concorde Agreement, a commercial arrangement involving the racing teams, CVC and the sport's governing body, the FIA. This agreement says that the sport should be shown on free-to-air television where possible. However, the current agreement runs out at the end of 2012, and the signatories are in the process of negotiating a new one. The BBC currently has the UK broadcasting rights to F1 until 2013. Mr Ecclestone, who runs F1 on behalf of CVC, told the Times on Wednesday that selling the business to News Corp would complicate F1's freedom to negotiate rights to screen the sport. "We would not sell to a media company because it would restrict the ability to negotiate with other broadcasters," he said. News Corp, which owns 39% of broadcaster BSkyB and is trying to buy the rest of the company, could face regulatory hurdles if it took on broadcasting rights. In 1998, News Corp tried to buy the Manchester United football team but was blocked by the Competition Commission because of Sky's dominance in broadcasting the sport.